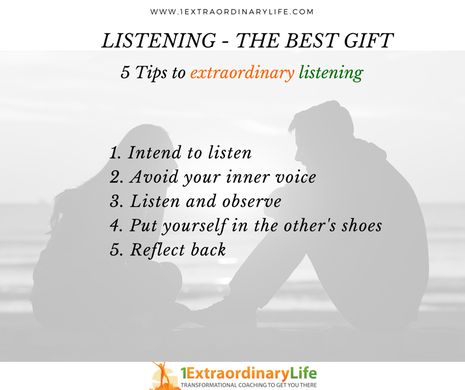 When I was a student at the University of Pennsylvania, Dr. Jaggard, one of my Leadership Class professors, stated the following: “Listening is the best gift you can give someone.” That statement has always stayed with me. In today’s life, where the methods of connecting have become so vast, there has never been a time when we have become so disconnected. We are connected in the superficial sense, via email, text, social media, etc. However, when it comes to quality conversations, it is becoming more and more difficult to find someone who truly listens, as I am both increasingly witnessing firsthand and also hearing regularly from my clients who express concerns about a lack of deep communication with others. Just the other day, I had a parent complain that, despite her wanting to listen to her son, he doesn’t seem to have the time to sit and listen to her. Amidst an increasingly busy lifestyle with people trying to cram in as much as possible in the available 24 hours, it’s no surprise that we don’t dedicate the time to listen to others, including our loved ones. How many times have you asked someone how they were, only to wish you’d never asked once they really started telling you how they felt? Have you ever been to a meeting at work and felt that your voice went unheard? 1. Be intentional about listening - If you have resolved that you will spend the time to engage in a conversation with someone, then why not be intentional about giving it your best? Why not be intentional about giving the other person a chance? You’re investing the energy anyway so make good use of it and don’t let your energy and time go to waste. Make it count, be intentional and keep that intention in your mind as you do. 2. Avoid your inner voice - This takes training and, in most cases, undoing a lifetime of judging others, wanting to problem solve and all kinds of other mind chatter. One way to remove judgement and all of the other distractions going on in your mind is to remember point 1 - your intention - and then to make a conscious decision that when you are listening, it’s about the other person, not you. This is when the gift of listening starts to bear fruit, when the person you are listening to realizes that you are truly paying attention. 3. Listen to the whole person - When someone talks, it’s not just about the words. It’s about how they are saying those words; it’s about the tone, the emotion, the gestures, the body language. Be a good listener by being a good observer. Observing and making a mental note of the whole person will help you delve deeper into the conversation, express emotion where warranted and react appropriately. 4. Imagine if it were you who was being listened to - How would you want to be heard? Would you want to be given the distinct sense that you are not important and that other things matter more than you? Of course not. A conscious thought about giving the same respect to the other person and remaining aware of what you would want from them will help you focus on the conversation and listen better. 5. Reflect back - Acknowledge and show that you are fully engaged with the other person by reflecting back what you have heard. Showing some kind of genuine emotional connection helps with this. Such feedback would allow the person to feel appreciated and to also make you an active participant in the conversation; and that is, after all, the whole point. Sometimes just keeping in mind that you will reflect back what you have heard the person say helps to both get and keep you engaged in the conversation. Once you start practicing the above, notice the difference in the quality of your interactions. I guarantee you will get more out of your conversations. You will have productive meetings and accomplish more in less time. You will also feel better - listening causes the other person to know that they matter, that they are important and that you are there for them. Give people an extraordinary gift. Show them that they matter through better listening habits. If you would like to learn more about how to listen better or how to improve your interactions with others to show that they matter, contact me and we can talk about how Positive Psychology can provide you with the tools to do just that. Excellent points - they look as if they are from the playbook of the organization with which I'm affiliated: Vistage. We're taught to use these very same concepts in our 1-1 meetings with members. One of the challenges with which I wrestle - and which I'm working hard to overcome - is to refrain from thinking about what I'm going to say next while the person sitting across from me is speaking. That's a remnant from my days as a professional sales person.